Thanks to the Internet and search algorithms, people learnt to express their informational need in the form of keyword queries. Keywords can be easily called the major concept of the global theory of search optimisation because they are the point to start out any web search. Undoubtedly, one of the optimisator tasks is a competent assortment of key phrases for the promoted web-site (or an ability to create so-called semantic core of requests) along with effectiveness analysis for each query in the core. Below you can find the stages that you should pass alalysing keywords. Fulfilling these points you can decrease expenses for further works in website promotion. So, what are these stages? Key queries are not born by themselves, they are created by people. Who are they? Defining the very group of Internet users that may be interested in website attendance, acquiring information, purchasing goods or ordering a service represented on the webpage, we can easier find used words and phrases that can be possibly used in search. Also, knowing your target audience helps to resolve a range of other tasks, for instance, while working with site usability. Brainstorm. Generate any ideas of key phrases that are most matched to the site or business that they represent. Search hints. Enter brainstorm-generated keywords into Yandex or Google search bar and look for the variants of additional phrases coming out as hints of search engines. Instruments to assort key phrases. 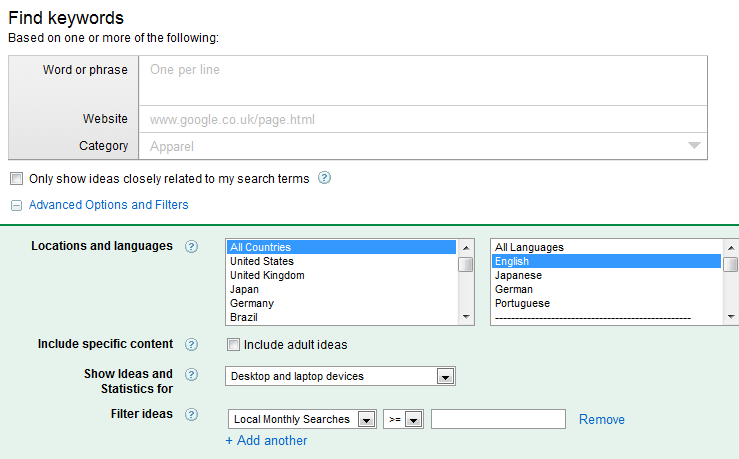 Try Yandex.WordStat or Google Keyword Tool to look for the new options and extend your list. Website statistics. If the site already exists and t has attendance counter, you should analyse keywords that users found it with before. Individual statistics gives much more variants than any other services. Competitor’s sites. It’s sure that world web already contains websites that are similar to yours. Analyse them and find out what keywords they use in content and links. Unfortunately, the majority of websites have confidential attendance rates. But you can learn about how the sites are found using third-party instruments like Alexa.com or SEMRush. Context advertisement services. Some of the context service advertisement such as Google AdWords, permit to select words entering specific page or site address. Use it to receive additional word options to the list, specifying addresses of websites that are similar to yours. Passing through the previous two steps, you probably formed a big list. But it can be enlarged even more. If your site is volume websites with numerous pages it is normal because the query core consists of thousands of variants. Moreover, in further steps many of them will be excluded. How can you expand the query core? Try to extent one-worded requests into multiword. Apply synonyms, abbreviations and acronyms. Combine words with each other. Find widespread typing mistakes and let them join your list. In spite of the fact that this article partially puts the concepts of “keywords” and “search queries” as identical ones, but they still have different meanings. Keywords exist abstractedly and we operate them at the website or in the list. Search requests are applied concretely in Yandex or Google. Before this stage the list of keywords could turn out huge but not all of them are convenient to apply. The first words to filter should become those that are not search queries. It’s senseless to operate those phrases that are not used by anybody. Also, depending on the project purpose, you can select more frequent or less frequent phrases requesting specific boundaries. For example, content projects, such as news aggregators, blogs, article resources and so on, should better use low frequency phrasings because they are able to bring more traffic to the site. In case the site already contains 5-10 statistic pages, using low frequency requests in the core is not as effective for traffic as using high frequency ones. As for Internet online stores, every owner of such resource should decide for himself how he is going to develop it, if there is a person to update web content, whether additional sections will exist, apart from good selection and shopping cart. Every query group demands its own target-oriented page. Now, after you have chosen search queries that can bring maximum traffic to the site, it’s necessary to monitor the measure of competitiveness for each of them. How do you check the query competitiveness? It’s necessary to introduce some metrics, for instance, the quantity of already existing responds in search engine. Surely, the count of response results do not demonstrate complete request competitiveness, but this s the simplest metrics that can be monitored manually without great effort (Also look up for some other ways to evaluate the competitiveness of a search request). Ambitious aims should be set, but at the same time you should consider your capabilities and apply better efforts to feasible results. Deselect the most competitive requests from the list, maybe, you will return to them, but you should start achieving the effect from minimal costs. Now the list is ready! What do you do next with it? Subscribe to our mailing list of articles that we try to give answers to many popular optimization issues in, as well as site promotion and Internet marketing in general. Good luck with website promotion! SEO	Do I Really Need a Website for My Business?